Aims: Analyse the frequency and sites of ectopic thyroid tissue detected during scintimaging of the hyperthyroid gland. Materials and methods: 190 consecutive scintimages of hyperthyroid glands were analysed. 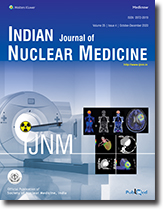 Dynamic flow and perfusion studies, Technetium-99m pertechnetate (Tc-99m04-) thyroid uptake and static images were obtained in the anterior RAO and LAO views along with a marker view to establish landmarks at the sterna notch and any palpable nodules. Results: Hyperthyroid glands showed Tc-99m04- uptake values ranging from 3% to over 30%. 87% of the glands were diffuse goiters while the remaining were due to Plummers disease or autonomous hot nodules. The size of the glands showed a mild to moderate enlargement with the longest length of the lobes being 5-7 cms. Ectopic tissue in the form of pyramidal lobe, thyroglossal tract, lingual, sublingual or substernal sites were noted. 44% of patients with elevated thyroid uptakes and a diffuse enlargement of the gland showed the presence of ectopic thyroid tissues. Of these, single ectopic sites was present in 78% of cases while the remaining showed dual and one case triple site of ectopia. There was no correlation of the presence of ectopia with size of gland enlargement, %thyroid uptake, clinical severity of the hyperthyroidism or the presence of antimicrosomal or antithyroglobulin antibodies. No thyroid stimulating immunoglobulin assays were done in our patients, however reports strongly suggest the association of detection of ectopic tissue with the presence of thyroid stimulating immunoglobulins in Graves disease and hyperthyroidism. Conclusions: It is therefore proposed that in the case of unavailability of assays for thyroid stimulating thyroid antibodies in Graves disease the detection of ectopic tissue can be used as a marker for Graves disease. The advent of chemotherapy drugs (as neo adjuvant treatment) has facilitated conservative resection (limb salvage surgery) in limb tumors (bone and soft tissue tumors) .In previous decades mutilating surgeries like amputation used to be the mode of treatment for these patients. In this context we have studied the uptake ratio of Tc-99m Sestamibi (MIBI) in limb tumors before any treatment was given and again after the neoadjuvant chemotherapy. Both Osteosarcoma and Ewing's sarcoma were studied. It has been widely reported that Multi-drug Resistant gene (MDR1) expression in tumors can give rise to resistance to these drugs. We have correlated the response of these patients with the washout of MIBI from these tumors. Methods: 44 patients with limb tumors (34 Osteosarcoma and 10 Ewing's Sarcoma) were studied. In Osteosarcoma (OS) patients, the 1st study was done before any chemotherapy and 2nd study after 3-4 courses of chemotherapy. In Ewing's Sarcoma (ES) patients 1st study was done before any treatment was given, 2nd after 3 courses, 3rd after 6 courses and 4th after 12 courses of chemotherapy. The uptake ratio (UR) was calculated by dividing the number of counts in the involved tumor site by the number of counts in the contralateral symmetrical uninvolved site. Response ratio (RR) was calculated using uptake ratios in the first two studies in all patients. The wash out ratio of MIBI from the tumor site was also calculated in the first study. These ratios were correlated with clinical and histopathological responses. Results: 26 out of 34 OS patients had WR of more than 60 % over a period of 2 hours. Still 19 patients had responded clinically and had Limb salvage Surgery (LSS). Conclusion: There was no direct correlation between washout ratios and clinical responses in most of the patients. Those with high WR had responded clinically and had limb conservative surgery (LSS). This study has to be corroborated with further quantification of Pglycoprotein at molecular level. A 26-y-old lady was diagnosed with afibrogenemia, increasing breathlessness and pleural effusion and underwent a right thoracotomy. Postoperatively, a recurring right pleural effusion developed. Because an attempt at lymphangiography failed, lymphoscintigraphy using sulfur colloid was done. The study confirmed the diagnosis of chylothorax. The authors report a case of pathological fracture in an incidentally detected Paget's disease, where in the site of fracture was unusually located at the transition zone between the normal and abnormal bone. 99mTc Methylene Diphosphonate scan characteristically showed the abnormal uptake extending up to the fracture site but not involving it. We report a case of osteosarcoma showing intense 99mTc- Methylene diphosphonate uptake in metastatic lung nodules. The pattern of uptake and differential diagnosis are discussed. We report a case of Budd-Chiari Syndrome documenting the importance of Tc-99m Sulfur Colloid Scanning & it's role in further line of treatment management. Planar imaging is usually undertaken to sample whole body or specific area of interest to ascertain radiotracer accumulation. Presence of any other pathology near the area of interest may produce a wrong interpretation in a planar image. To overcome this problem, tomographic imaging using SPECT is useful. We present a case where SPECT imaging helped in localizing the site of infection in an 80-year male patient with right hip prosthesis undergoing 99mTc-Ciprofloxacin (Diagnobact) imaging for ruling out infected prosthesis.